How frequently you simply ignore somebody pretending as if they don't have any value all? How frequently are you being ignored by other as if there is no existence of yours? So, what you think is ignorance a good habit or the bad. 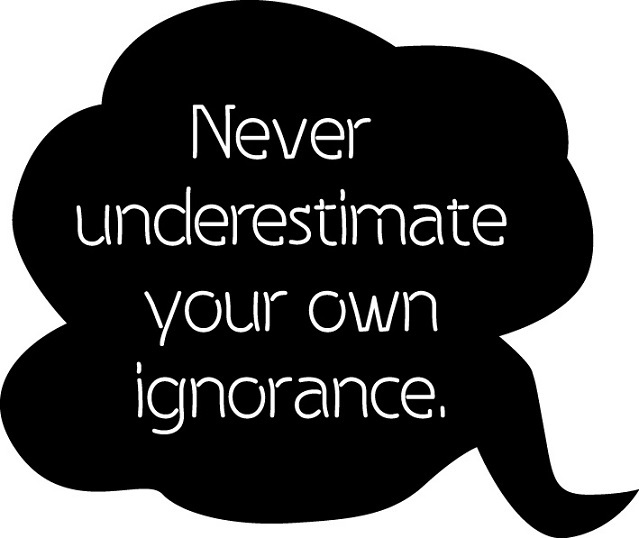 Actually ignorance is regarded as the bad habit as it directly means that not giving proper attention to the subject matter and circumstances of events. But somewhere else it might be useful as well for that you should already have to determine what things are important for you or say what sorts of suggestion and events are helpful for your personality development. If you are that much conscious about your future so there is no need to stop in every step of your journey when you have already fixed your destination to know something that provides very general and primitive guidelines and giving time to it is just the loss of valuable time on which you can reached to further when moved with any pause. How easily we ignore most important things in our life without any regret that last for that time being as after some time we get to know it was not good to ignore them at that time. It's become our habit to ignore anything simply though we know it troubles us later. But we dis-valued the importance of events or any important works as we begin to develop the habit of living in the life of current pleasure. The works which provides the current pleasure are very easy to accomplish as our total attention is acquired by the task during going on process. Haven't we get trouble when you ignore suggestion from our elder, parents and guardians? Obviously we had experienced this type of incident many times in our long journey of our life since our birth. In childhood we used to ignore everything and get pleasure doing whatever we like. But later on when we grow up in course of time we begin to listen to parents and we act as directed otherwise we get punished that was the case. The work that we can do couldn't be done as we are constantly in the environment where our guardians says what can we do and don't this action constantly hits our minds and we can't think that the work can be done by any of us. Thus we underestimates our actual power on listening to them which is the good example for ignorance is better sometimes when something tries you to pull down then encouraging to go ahead. Now, let's come to the point of ignorance between friends that especially among girls and boys. As per I get to know most ignoring are found to girls than boys. There might be various region behind ignoring that may be they are in journey and they may not like to stop anywhere till reach the destination somewhere else. That means any attention given anywhere may distract from the objectives. Ignoring to familiar friends might be due to they don't try to bring boys to close to them so to maintain some distance in relation and to minimize much closeness as they don't found their life secure with them. This may varies with people to people so anyone can give any suggestion for this. I appreciates your feedbacks. Have your remaining day happy and Nice.